A while back, we were asked to review a workout plan pioneered by a UK-based personal trainer called Eric Blackburn. This book proved to be a fascinatingly unique dive into the world of building muscle. It used a unique style of ‘loaded stretching’ which enables you to grow muscle much faster than you can be ‘just’ lifting weights. The reviews speak for themselves, and Blackburn is quickly becoming something of a ‘celebrity’ personal trainer himself. Yesterday, Eric Blackburn’s publisher reached back out to share his latest book, which dives into the world of celebrity personal trainers. All things considered, we figured Blackburn to be as good as anyone when it comes to diving into exactly what mysterious techniques are used to transform Hollywood’s top bodies, so we agreed to take a read. 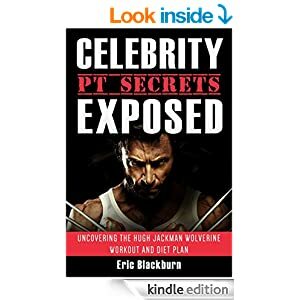 This book focusses on a personal trainer called David Kingsbury, who is the man responsible for crafting Hugh Jackman’s Wolverine body. The book is thus entirely focussed on diving into the Wolverine workout plan, and it does so by cleverly merging just enough information without over bearing us. With 69 pages of analysis, this is plenty and it offers some really interesting insights into exactly how Jackman was able to radically change his body at an age when most of us are suffering from advancing middle-aged spread (Jackman was 46 when he transformed his body). The premise behind the book is quite simple. Actors and actresses are not necessarily ‘into’ training. As a result, they turn to Hollywood’s finest personal trainers. These are folks who know all of the secrets of getting you into shape fast. Rapidly, these PT’s are becoming as important as the movie stars agent. We live in a world of high-definition TV, where the human body is showcased like never before. What’s more, there is a new expectation in Hollywood around the male body. Take James Bond. Back in the days of Connery and Moore, they would rock up at Pinewood and film in less than stellar condition. In essence, the director didn’t really care how they looked, so long as they weren’t remarkably out of shape. Now look at the James Bond that Daniel Craig re-engineered. He is a lean, mean fighting machine, and who knows if Bond can ever regresses from here? So when Hugh Jackman needed to transform his body to play Wolverine, having just finished filing Les Miserables, he turned to a Celebrity PT. Eric Blackburn has dived into the details behind the Wolverine workouts, and analyses them from a top PT’s perspective. This is where this book gets interesting. Not only is it a guide to what Jackman was put through, but it is also an in-depth dive into why he was made to do what he did. Blackburn, as one of the UK’s leading PTs, is well placed to give his perspective as he himself has proven to be the master crafter of the human form. Blackburn is famed for his highly unusual training style, and as a result has become something of a ‘go-to’ guru for competitive physique athletes. He’s know as the ‘cover model creator’ for his record of transforming male bodies into the classic ‘Men’s Health’ look in rapid time. He achieves this through his unique diet and training methodologies, both of which go massively against the norm. So his take on Kingsbury’s methodology is worth a read in its own right. The book gives you the evolution of the Wolverine training plan. It takes you on Jackman’s training journey, and showcases two workouts from the different movies. It also talks you through the diet plan and how they were able to work together to build Jackman’s body despite a hectic filming schedule. Finally, the book shares the PT’s top 3 training tips for building more muscle quickly.